This DB9 to Terminal is designed to convert the RS422/485 signals in a Micro sized package. The iSerial-TB5 DB9-Female to 5-pin Terminal Block RS422/485 Adapter conversion takes place from the DB9 (male) to 5-pin 3.5mm Terminal. A passive adapter Supporting DB9 Female to terminal output RS422 or RS485. Supports screw type wiring to meet standard industrial wiring applications. Supports 3 modes: 4-wire RS422 (TXD+/-, RXD+/-), 4-wire RS485 (TXD+/-, RXD+/-) and 2-wire RS485 (Data+/-, Data+/-). The DB9 to Terminal Micro sized iSerial-TB5 is a passive micro DB9-Female to 5-pin Terminal Block adapter. 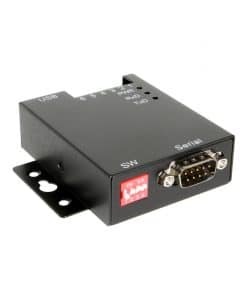 This RS422/485 adapter is designed to convert the RS422/485 signals from the DB9 (male) to 5-pin 3.5mm Terminal Block connector. With the iSerial-TB5 built-in DB9-female (DCE) connector and 3.5mm 5-pin Terminal Block, the DB9 to Terminal provides a flexible and reliable conversion for a DB9 based RS422/485 port. The terminal block supports screw-type wiring to meet the standard industrial wiring applications.